Announcing the availability of the latest TeeChart Java v2018, Build 3.2018.0305 release. All TeeChart Java libraries have been updated supporting Swing, SWT and Android. The updates may be downloaded via the customer page. Announcing the availability of the TeeChart for .NET 4.1.2017.10190-10196 release. Announcing the availability of the latest TeeChart Java v2017, Build 3.2017.0622 release. All TeeChart Java libraries have been updated supporting Swing, SWT and Android. The updates may be downloaded via the customer page. Announcing the new version release of TeeChart Java v2016, Build 3.2016.0419. All TeeChart Java libraries have been updated supporting Swing, SWT and Android. The updates may be downloaded via the customer page. TeeChart for Xamarin.Android 2015, latest maintenance release (build 4.15.5.18), now available. Announcing a new build release of the TeeChart Charting Library v2015 for Java platforms Swing, SWT and Android and BlackBerry mobile devices. Announcing a new build release of the TeeChart Charting Library v2014 for Java platforms Swing, SWT and Android and BlackBerry mobile devices. TeeChart for Xamarin.Android 2014, latest maintenance release (build 4.14.6.25), now available. Announcing a new build release of the TeeChart Charting Library v2014 for Java platforms Swing, SWT and Android and BlackBerry mobile devices. The Android chart component now includes support for multitouch zoom and scroll. We're very enthusiastic here at Steema about the new development environment, Appmethod, announced by Embarcadero last week! It's clearly going to offer up many new possibilities for those who are not familiar with RAD Studio but who want their development to reach natively across desktop, server and mobile platforms. 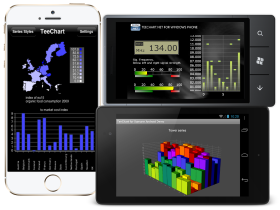 Announcing a new build release of the TeeChart Charting Library v2013 for Java platforms Swing, SWT and Android and BlackBerry mobile devices. TeeChart for Xamarin.Android 2013, latest maintenance release (build 4.13.12.13), now available. Steema is pleased to announce the availability of the TeeChart Charting Library v2013 for Java platform and for Android and BlackBerry mobile devices. TeeChart NET Xamarin.iOS and TeeChart NET Xamarin.Android Charting libraries now offered at the new Xamarin Component Store. 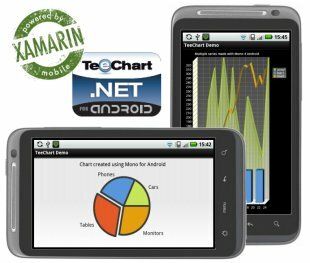 TeeChart for Xamarin.Android 2013, latest maintenance release (build 4.13.03.04), now available. TeeChart Mono for Android 4.0.2012.121203, latest maintenance release, now available. TeeChart Java for Android v3.2012.1120, latest maintenance release, now available. Steema is pleased to announce the availability of the first release of the TeeChart Mono for Android Charting Library for Google's Android mobile platform. The TeeChart Charting Library offers over 60 Chart styles, 40 mathematical functions and a full set of Chart tools components for additional functionality. The .NET Mono Android Charting library is built using TeeChart .NET's C# code in Xamarin's Mono for Android IDE. Use your .NET C# code to create Charting applications for Android mobile devices! Steema is pleased to announce the availability of the second BETA release of the TeeChart Mono for Android Library. Use your .NET C# code to create Charting applications for Android mobile devices! The .NET Mono Android Charting library is built using TeeChart .NET's C# code in Xamarin's Mono for Android IDE. Steema is pleased to announce the availability of the first BETA release of the TeeChart for .NET Mono for Android Library. Use your .NET C# code to create Charting applications for Android mobile devices! The .NET Mono Android Charting library is built using TeeChart .NET's C# code in Xamarin's Mono for Android IDE. TeeChart for Java v2012 released! Steema is pleased to announce the availability of the TeeChart for Java v2012 Charting Library. 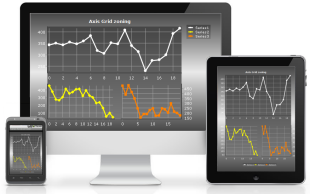 TeeChart Java for Android v3.2012.0202, latest maintenance release, now available. TeeChart Java Chart for Android now available! We are pleased to announce the availability of the native Java chart component version of TeeChart for Android! Available with or without 100% sourcecode TeeChart's Java Chart for Android may be used with the freely available Android SDK. For more information see TeeChart's Mobile pages. An evaluation version may be accessed via the download page. The evaluation is fully functional, the Tee Chart Android charts bear a light watermark as a reminder. TeeChart for Android 2nd BETA Update Available! Steema Software is pleased to announce the availability of the TeeChart BETA for Android development environments. The BETA, downloadable from the TeeChart Java Evaluations page, written in Java, may be included in Java Android development environments. An installable preview is available for installation from the Android Market. For more information see the preview announcement.